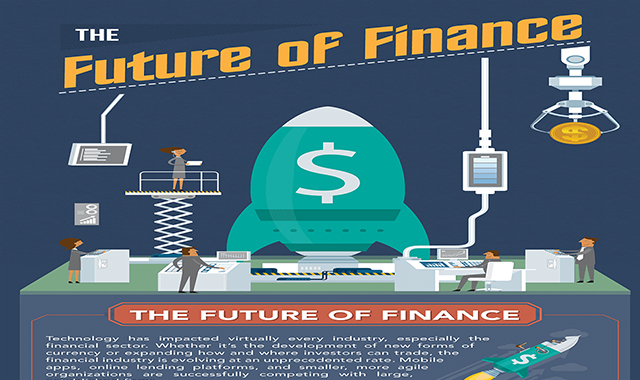 The Future of Finance #infographic ~ Visualistan '+g+"
Technology has impacted virtually every industry, particularly the financial sector. Whether it’s the development of new forms of currency or expanding how and where investors can trade, the financial industry is evolving at an unprecedented rate. Mobile apps, online lending platforms, and smaller, more agile organizations are successfully competing with large, established firms.Fintech manifests itself in the banking sector through tech-driven innovations like virtual banking, mobile banking, and other banking platforms. Examples of banking sector fintech in action include Seed, Simple, and LendStar. The payment sector uses fintech to propel several modern conveniences, including virtual wallets, online payments, and mobile payments. Fintech is found in the investment sectors through avenues pertaining to personal finance and investment platforms. Looking at the financing sector, one can see fintech behind concepts like P2P lending and crowdfunding. The insurance sector incorporates fintech through online insurance infrastructure, insurance comparison, and health insurance. Finally, infrastructure and the enabling tech sector utilize fintech through cryptocurrency, biometric security, authentication, and data research.